Play Chronicle: Runescape Legends at the PC Gamer Weekender in London from March 5-6. Click here to find out more. 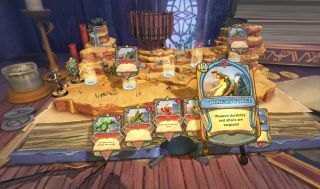 Everyone's having a crack at collectible card games since Hearthstone started doing its thing, but while The Elder Scrolls: Legends is playing its cards close to its chest, Chronicle: Runescape Legends enters open beta on March 23. Jagex has made an effort to stand out. Rather than trading card-based blows, opposing players go on a journey through famous locations from Runescape's realm of Gielinor. You both set down your cards in advance, which then play out in turn as the adventure progresses, diverting your character from time to time to take on monsters and buy gear. The open beta brings updates including new playable legends (Venescula the Vampyre and Morvan, the Slayer Master); an ever-so-Runescape Skilling system, by which every action earns experience in one of Chronicle's skills; Dungeoneering mode, in which you play with a drafted deck; Legend customisation; leaderboards; and new locations like Barrows and The Wilderness Crater, which should elicit a long sigh of nostalgia. Of course, if you'd like to get your hands on Chronicle even sooner, Jagex will be bringing it down to the PC Gamer Weekender on March 5-6 in London.